Impressive selection of this wonderful native annual. Leaves are brightly frosted in white and make a great backdrop to the sky blue nickel sized flowers. Blooms April-June in part shade to full sun. AKA Frosty Blue Baby Blue Eyes. To 4″ x 6″ forming a spreading plant. 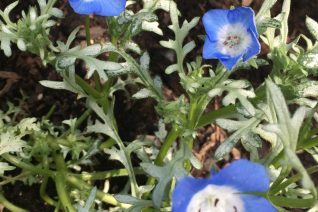 Very attractive and it will reseed in the autumn or early spring- the seedlings are immediately identifiable by the silver foliage. Likes to germinate among other small plants/grasses for overwintering protection. Water to establish then only lightly until bloom has ceased and seed is set. The whole plant dies and decomposes almost instantly in the real heat of summer. Excellent in early season containers. This form was found in California but this is also an Oregon native plant. 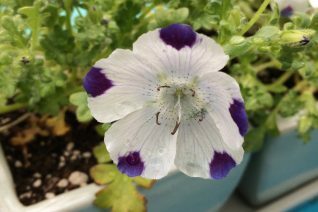 Five spot is a showy and adorable west coast native true hardy annual that delights under oaks with 1″ wide white and blue flowers. One deep blue dot at the tip of each of the five petals. To 4″ tall and sprawling to 8″ wide the cheery flowers appear from late March to June before the plant completes its life cycle and dies and goes to seed. Reseeds reliably in open disturbed sites. Fine leaves on small rosettes tell the story in autumn. Self sown plants require no supplemental water. One potted plant will yield hundreds of seedlings for the following spring. West coast annuals are cool. Found in a small part of Josephine and Jackson counties in southern Oregon. Oregon native plant. Baby Blue Eyes a hardy annual wildflower native to the bottom third of Oregon is a beautiful shade of blue in spring gardens. Finely divided foliage forms sprawling rosettes that support the nickel sized sky blue to pale blue flowers. Blooms April to June. Reliably reseeds in open disturbed sites. The whole plant is dead and chucking seed by the heat of summer and ultimately disappears on its own. Adaptable to any soil type in full sun to light shade. Self sown plants get by with no supplemental irrigation- plants from containers seem to like regular water. To 4″ tall and 1′ wide. 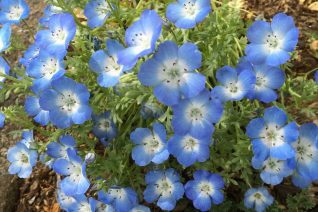 Oregon gardeners should discover the advantages of our own hardy native annuals. They occupy space between shrubs happily and laugh at summer drought by finishing their life cycle and simply spreading anew by seed. Oregon native plant.